I created an url alias for each language (which is mysite/appartments although the default language of my site is spanish) so the spanish alias for appartments is apartamentos and so on. I created these aliases using configuration >> Search and Metadata >> URL aliases >> add alias. and the same occurs for all the languages. The rest of the thing seem fine and even the breadcrumb (which is generated using the url) looks correct ( Inicio >> Apartamentos Costa Dorada, in Spanish). When I use the language switch it redirects me to the correct translated page but without the query parameters (from mysite/es/appartments/p/location_field/2 it sends me to mysite/es/apartamentos). I don't know what can be causing this issue, maybe the query parameters interfering with the alias interpretation? Note: I have a lot of translation modules enabled. For the i18n modules there are: block, field, menu, node, path, string, taxonomy, translation (translation sets), variable and views. ... allows you to map together existing pages that are translations of each other. This will allow users to use the language switcher to navigate between the associated pages. The module is meant to be used as a last resort to translate paths that can't otherwise be mapped together as translations. For example, paths to translated nodes can already be linked with the Content translation module and paths to translated taxonomy terms can be linked with the Taxonomy translation module. 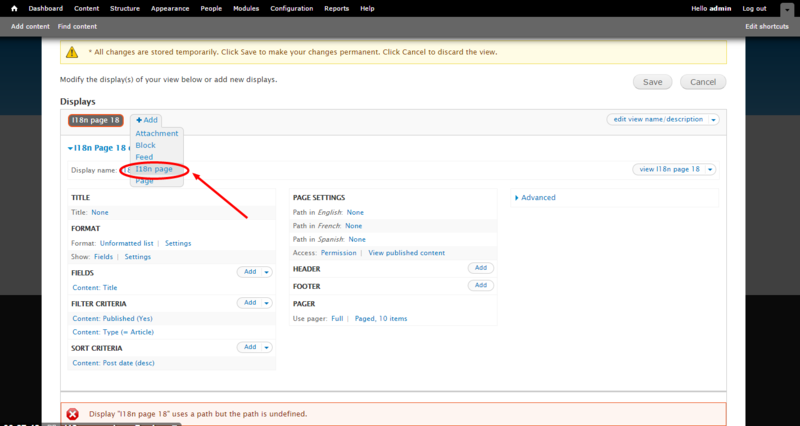 Path translations should be used to link generic paths, such as those provided by Views or Panels. To set up translations of a particular path, you need to create a path translation set by going to Configuration > Regional and language > Translation sets > Paths and clicking Add path translation. ... provides a new display of views, where you can select different paths for each language enabled on your site, so a view has a localized route for each language. Note 2: To answer the question about "Will I have to create the whole view page again to make it as an i18n_page?" (as in one of your (now deleted) comments below this answer), I would give it a try using either of the approaches described in the answers to the question at How to duplicate a Views display (which is not the master) as a different display type? ... If that doesn't work / apply, then recreation of the whole view page seems like the only option left. or just do your own paths via custom page callbacks (hook_menu) and then show the view with views_embed_view. Taken form here How do I change submit URL for exposed search filter? Not the answer you're looking for? Browse other questions tagged 7 views i18n-l10n redirect or ask your own question.